I managed to finish my first block for the FWQAL. 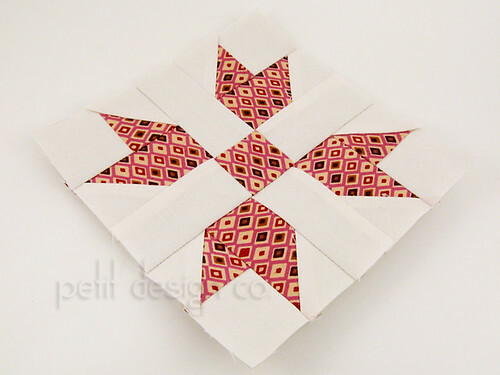 It's block # 14 and it's called " Butterfly at the Crossroads"
As I mentioned before, I will be paper piecing my blocks because that is a skill I want to learn/improve. This block took me waaaaay longer (like an hour!) than a rotary cut version would have taken. I attribute that to being such a novice paper piecer! It's a bit hard for me to wrap my brain around something that seems "backward" to me. I found Sonja's video tutorials over at Artisania super helpful. I know that, just as with any new skill, the more I practice the easier it will become. Besides it's worth it to have almost perfect blocks. I say almost because I'm still learning. I only had 2 points that didn't match up perfectly, but they are not horribly off. My block finished at 6.25" square. I know that over on the Flickr page everyone is having their blocks finish up at varying sizes. 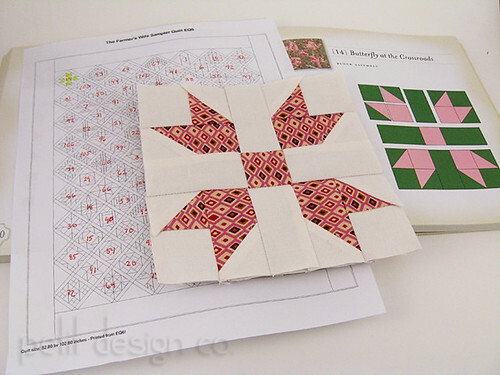 Since I printed my paper piecing patterns from EQ6 I was able to open the block and check on the finished size. EQ6 says that the finished block size is 6". So once you add in seam allowances all around it should have finished up at 6.5" square. I'm not sure why it didn't end up being the correct size. The only thing I can think of is that it's my printer. I did make sure to print it at "actual size" with no scaling so that shouldn't have affected it. Honestly I don't' think it's that big of a deal as long as I keep using the same printer and settings to print up all of my patterns then all of the blocks should end up finishing at the same size. Oh, in case you're wondering about color scheme... I'm going with bright and scrappy on Kona Snow. I'm going to limit each block to 1 or 2 colors max in order for it to be visually pleasing. I don't like scrappy quilts that make my head spin!